- When you spawn, you will find the first portal in front of you. You must activate it by interact with the Corruption Engines in front of it. - Survived from the small zombies until the red portal opens and then go inside. Thus you have entered one of the hidden unique locations. 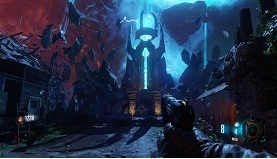 - The other places you reach via the blue portal, which are hidden on each level of the game. - Try to spend your points only for the blockades that you need to visit all the unique locations. - If you succeed to clear the way and gain access to all the unique locations then you have to run. - You need to run a little because the time is quite short. - You can always start the game. It does not mean that you have to visit all the locations within the first 2 minutes of the game, which gives you a lot of time to leave. Now check out the following video and follow the specified path as quickly as you can. Do everything as shown on the video; you need to visit all the unique locations within 2 minutes to unlock "The Grand Tour" achievement.